When Peter was born he was next in line to two living brothers – Andreas, 6 years old and Johann two and a half. The eldest brother and two sisters had died before these three boys were born. When Peter was almost three years old a sister, Maria was born, and she was the only sister to reach maturity. Peter began school near Wurschen (a village 2 kilometres northeast of Drehsa) in 1831, and continued there for eight years. The school was a solid large house outside Wurschen, on the edge of a lake with a variety of fish in it. The teacher lived in one end of the house and the other half was the school. [Today it is a beautiful home with a family living in it. Later in the century a school was built right in Wurschen, and now this later one is called the ‘old one’ and a newer school now stands alongside it.] During his second year at school a sister Magdalena arrived, but died two years later. In his fifth year at school another brother arrived, but was stillborn. A year later his youngest brother Karl arrived. Peter left school on 13th March 1839 when he was almost 15 years old. Avoid the passions of youth, and strive for righteousness, faith, love, and peace, together with those who with a pure heart call out to the Lord for help. But keep away from foolish and ignorant arguments; you know that they end up in quarrels. Peter turned 15 in May 1840. He had two older brothers, a younger sister and two younger brothers. The youngest, Karl, was then two and a half years old. He began to look for a job. He found an opportunity near Dresden, the Capital of Saxony, about 65 kilometres from home. Peter was vaccinated against Small Pox. The above mentioned has been living with his father, the Gardener Zwar in Drehsa. He was confirmed and vaccinated against smallpox. With the permission of his father he wishes to take up employment near Dresden. Pages 3 to 8 give a detailed list of numerous rules governing apprentices and their relation to their employer (in whose home they usually lived). At the end of each year the Master would give a brief report that would be signed by a witness, such as an accountant, councillor or a Judge, and a seal would be attached. Peter began work at Hühndorf near Dresden on New Year’s Day 1840 under Johann Gottlieb PIRTZICH. On 20th March 1840 Peter’s father died. Peter was 15 years old. The responsibility for looking after his mother and the younger brothers and their sister Maria fell on the oldest living brother, Andreas. Witness: Joh. George Rühle (Judge). From 8th May until the end of the year Peter worked as a farmhand for Carl Wilhelm Pietsch. At the beginning of 1844 we find Peter back at Unkersdorf again, this time working as a farmhand for Carl Gottlieb Bartz.Peter turned 20 in May and was now eligible for his 2 years military service. On 6th December 1844 Peter received exemption from military service from the Military Recruiting Centre at Dresden on the grounds that he was medically unfit. Peter continued working as a farmhand for Carl Bartz until 19th April 1846. He had been there 15 ½ months and conducted himself as usual “in a faithful, honest and diligent manner.” Peter had apparently built up a good reputation at Unkersdorf. He now begins work there as a carpenter’s apprentice under Joh. Heinrich (Master Carpenter). In 1847 Peter gets permission to go home during the winter months until the carpentry work would begin again. Peter Kaiser, a councillor, signed a statement that Peter conducted himself in a faithful, honest and proper manner while staying with his mother from 3rd January until 14th April. (The Kaisers were good friends of the Zwar family. They were guests at Johann Zwar’s wedding that year. Little did Anna Kaiser, only 10 years old, dream she would become Johann Zwar’s bride at his second marriage 16 years later in Melbourne, Australia). Peter was probably home again for his brother Johann’s wedding at Purschwitz, about 5 kilometres northwest of Drehsa. Johann was the first of the family to marry. Peter completed his apprenticeship in the art of carpentry on 3rd January 1848 and received an official certificate to say he was a qualified carpenter. The wax seal shows a carpenter’s square and compass, an adze, mattock and hammer. The certificate gives his name as Friedrich Peter Zwar, the only time we have a record of Friedrich as one of his names. He had begun his apprenticeship on 3rd January 1846 and graduated exactly two years later. We know nothing about Peter in 1848. Times were hard. There had been three successive years of drought. There was general unrest throughout Europe. In Saxony the Wends sent a petition to the Prime Minister asking for wider official use of their Wendish language. Peasants began forming associations for better conditions under the feudal landlords. A ‘Peasants Petition’ was published in the newspaper in June asking for better conditions but it remained unanswered. A number of people were considering migrating to the New World, to the Americas or Australia. There had been letters and brief reports for five or six years about Germans who had migrated to South Australia. Shipping agents were looking for passengers to fill their ships and gave glowing reports of the new countries, including Australia. At today’s other examination he has been found totally unfit and is definitely exempt from military commitments. The Royal Recruiting Commission in the 2nd Zone of the Bautzen District. We are not told why Peter was medically unfit for military service. His younger brother Michael was not so fortunate. He had just turned 20 and was due for his two years of military service, and his sympathies lay with the peasants and not the army. Michael decided to leave the country. He could not do so until he had completed his military service, and he could not leave officially without a passport. So he left without one. It is said he hid under a load of vegetables until his ship left port. On 23rd August 1849 the ship Pribislav sailed for Melbourne in Australia with Michael on board. The passengers were Wends and Germans who had been encouraged to go to the land of Promise by a shipping agent named Hartig. The family waited to hear word from Michael. His sister Maria wrote so he would receive her letter by his birthday (15th May). Johann wrote and asked what things were like, as he was considering going to Australia too. In fact all the family were considering it, even their mother. There was no word from Michael. They might possibly have heard from others that Michael had arrived safely in Australia despite being severely ill on board ship. A year after Michael left there was still no word from him. Johann and his wife and their little daughter Maria, and also Peter began making preparations to go to Australia. Paid with 1 schill. 5 pf. All military and civil authorities are requested to let pass and travel unhindered, and to assist and protect when necessary. Born and a resident at Drehsa who travels without attendants (accompaniment) to Australia. Requirements in regard to military conscription: is free. For some reason Peter changed his mind and decided not to emigrate to Australia in 1851. His brother Johann became the leader of a group of 98 Wends who made the journey to Australia on the ship Helene that sailed from Hamburg on 20th August 1851. Johann intended joining his brother Michael in Melbourne, but when the Helene called in at Adelaide a number of Wends living in South Australia called on them and convinced some of them, including Johann Zwar, to stay and help them with the harvest. Although Johann later visited Melbourne he settled in South Australia at Ebenezer, a Wendish community in the Barossa Valley. Michael made it clear that they would have to be prepared to work hard and overcome many obstacles if they wanted to join him. Johann wrote letters home too and told them about life in South Australia. The owner commences his travels on the l5 June this year, first of all through Leipzig to Hamburg. On 25th June 1854 Peter Zwar married Magdalena Pätzold (Batz or Bötz in Wendish) in Gröditz. (?). He was 30 years old, and Magdalena 22. Magdalena had been born at Nechern on Christmas Eve 1831. The Zwars travelled through Nechern only three kilometres from their home on their way to church from Drehsa to Gröditz. Magdalena received her schooling at Wurschen, the same school as Peter Zwar. She was confirmed in the Lutheran Church at Gröditz by Pastor Andreas Voigt, the same Church where Peter had been confirmed. Magdalena was the seventh child of the Gardener Johann Bötz and his wife Marie nee Rentsch. On the marriage records in Gröditz Magdalena is described as the third and youngest daughter. Her passport was issued at Wurschen only three days before the wedding. Her occupation is given as a “servant” and she is described as “born and living in Nechern”. paid with 1 schill. 5 pf. All civil and military authorities are requested to let travel unhindered and to assist with protection & help when necessary the bearer of this. The newlyweds planned to leave on 4th July for Hamburg and travel by train via Leipzig. On the 3rd festival day of Pentecost, various tools, namely a [forked?] straw cutter and some [?] flax, as well as some items of clothing, will be sold to the highest bidder against payment in cash, at the home of Peter Zwahr, carpenter in Drehsa. Commences at 2 pm. The ship Steinwarder sailed from Hamburg on 16th July. Tradition has it they caught the ship with three hours to spare. The list also includes “Adreas Schneider, from Drehsa, Saxony, Farmer. Peter and Magdalena went to Ebenezer and lived with his brother Johann Zwar and his family in the Barossa Valley in South Australia.Peter always called his wife Lena, the shortened form for Magdalena [or Magdalene – both spellings occur in her papers]. The church was the first Lutheran Church built at Ebenezer and was opened in 1859. Peter did the carpentry work. When the church was later dismantled, to be replaced by a new one Peter’s initials could be seen on some of the timber. “I remember seeing his name ‘Peter Zwar’ on a number of the beams supporting the thatched straw roof when the church was being demolished in 1905. My uncle Paul Zwar bought the old church building and used parts of it in building a barn and implement shed on his property at Ebenezer”. Peter also worked the land. One of the main aims of the Wends who migrated to Australia was to own their own land. In their experience at home it was the wealthy who owned land. It was almost impossible for the average person to own land such as farming country. “The land here is not as level as it is where you are in Unkersdorf and Steinbach, but it is rather hilly…” “I have 70 acres of land and put it under wheat with two horses. I reaped more than a thousand bushels of wheat. Everything here is done with machinery. 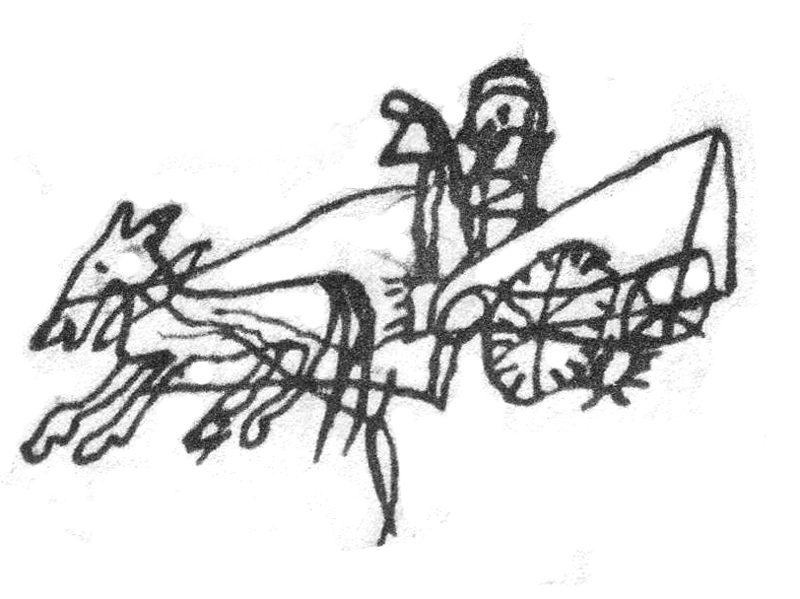 Peter includes a delightful little ink pen drawing of his Australian stripper being pulled by a horse! Elizabeth Johanna arrived on 12.7.1869. Peter and Magdalena Zwar and their five children l to r: Ernst, Johanna, John, Andrew, Maria. c. 1866. On 19th March 1866 Peter Zwar bought 109 acres of land at St Kitts (section 304) from George Boback. It was about 10 kilometres from Ebenezer. George Boback returned to Germany with his wife and two sons, and then migrated to America. It seems the Zwar family moved to St Kitts in 1872. Peter built the house there. He may have built the house before the family moved in. On a chimney between the ceiling and the iron roof there is a large “P” (about 60 cm high) painted on one side, and a large “Z” on the other. On the stone gable of the house two sprigs of peppercorn tree leaves were carved in the stone, and between them the words ‘Gott mitt uns P Z.’ The house was lived in until 1954 and is still standing, though the front doors and the mantelpiece have been stolen.In 1872 Peter finished building a solid stable (still standing) with “P 1872 Z” carved on a stone high up on one end. The barn was used as the St Kitts hall for school functions, meetings, dances and card evenings until 1954. Hermann on 7th March 1876. Hermann died a little over a year later [4.7.1877] from measles. His grave lies in the St Kitts Lutheran Church cemetery. The remaining 9 children each lived to be more than 80 years old. On 14.12.1875 Peter bought 48 acres (Part of section 306) and 55 acres (Half of section 91) from Thomas Shearer [with a mortgage to J F W Koch 13.11.76, discharged 16.2.1880]. St Kitts was a farming community (and never a town). The Jericho family lived across the road from the Zwars. St Peter’s Lutheran Church was about one kilometre south of Peter’s place, but Peter belonged to a different Synod of the Lutheran Church. The children attended the Lutheran school and were taught by the teachers Rechner and Klar. Peter and Magdalena had a large family, including six boys. Ernst was learning his trade as a blacksmith. Peter looked for more land. The opportunities in the St Kitts and surrounding areas were limited. The land was expensive. On the fifth day of June 1878 Peter Zwar was naturalized as a British subject in the Colony of South Australia. He was 54 years old and he had been in Australia for 24 years. Peter bought land about 250 kilometres to the north in South Australia where land was cheaper and more land was being opened up. He bought 623 acres (section 99) near Booleroo Centre on 13th July 1877. It seems his son John worked this land with the hope of one day owning it. Then Peter bought section 209 from Menz near Wirrabara on 3rd November 1879. It seems as though some of the boys moved north and began clearing and working the land. In the meantime their oldest son Ernst had married on 26th June 1878. He was a blacksmith and lived in the Barossa Valley. Then their eldest child Maria Magdalena married Johann Traugott Joppich on 29th October 1878. They settled at Wirrabara. The first grandchild, Anna Maria Joppich was born on 14.8.79. On 16th February 1880 Peter paid out his mortgage to J F W Koch and five days later he sold all his St Kitts land to Falland, who lived there and became the butcher of the St Kitts District. As soon as their son Peter Traugott was confirmed at Stockwell on 14th March 1880 he went north apparently to join several of his brothers there. The rest of the Zwar family either moved north at this time too, or only later on. One source says they moved north the following year. [cf. obituary]. The first grandson was born when Johannes Ernst Carl was born to Ernst Zwar and his wife Bertha Buhlmann 5.6.1881. They had stayed in the Barossa Valley. 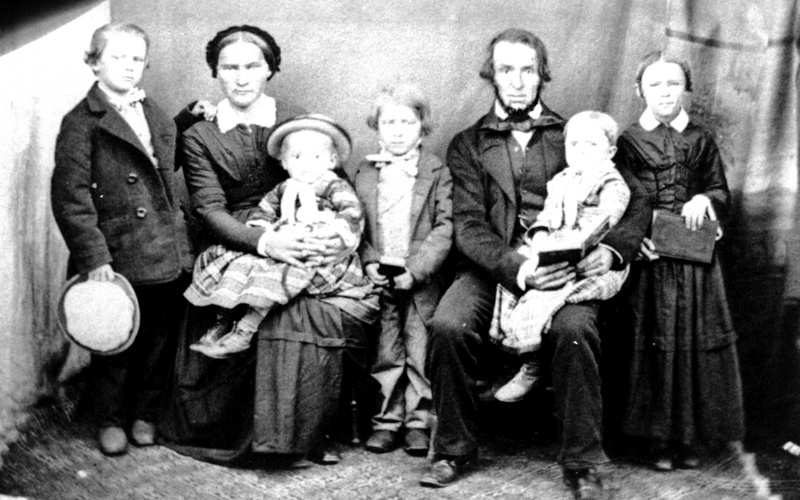 Johanna married Edward Altmann and their children started arriving in 1882. Magdalena Zwar became the District midwife, and the midwife for her family. She was often away from home as there were over 50 grand children to bring into the world. She even went to the Barossa Valley for the birth of the children of her daughter Elizabeth who had married Christian Johannes Koch. When she was away the granddaughters were called on to make the butter and do other household work. Her granddaughter Mrs. Dowling was born in a house only several hundred yards away. She recalled how Magdalena was often called out in the middle of the night. Magdalena would be away for three or four days and then come home to check all was well. She would tell them she had bought a baby. Then she would go back to the place for another 9 days. “She went fairly often.” She was midwife to all of her son Peter’s children. She was with her daughter-in-law Minna the day one of the little boys died in an accident in the barn, which brought on the premature birth of another son who died some days later. One wonders what would have happened had Magdalena not been there. The men were not at home and Magdalena was a strength of support to Minna during this tragic time when she lost two of her children. Lena was kind hearted. She always remembered to bake a cake for the grandchildren’s’ birthdays. She also made German wedding cakes. The grandchildren thought their grandmother was a wonderful woman. “Peter was tight. She had to keep the house on eggs and butter as well as being a midwife. A man would come by from Jamestown to buy eggs and Magdalena would sneak down and sell eggs and other goods and Peter would not know about it. This was her pocket money. When he was shaving Peter used to lather his face with a rabbit’s foot and this really amused the grandchildren. [Marie Schultz]. Despite what his wife told him, Peter firmly believed a man only needed a bath once a week, and that was on Saturday night before going to Church on Sunday. This practice applied even when Peter was doing work that made one dirty, like digging a well. When Peter dug a well near their house and close to the road, [You can still see the top of the well, but it has been filled with rubbish – K Z ] Magdalena was near the top of the well chatting with others when an excited call came up from one of the diggers at the well bottom announcing that they had struck water. Magdalena called back “Push him under, push (Peter) him under!” [… from Ed Zwar and various others]. In 1890 Peter wrote a letter to Germany and described the good life they were enjoying. There was a plentiful supply of meat. They killed two or three steers each year and about six or seven pigs. They had everything they needed. They could eat cake every day of the week (and not just on Sundays). He wrote that four of the boys were still at home. The youngest was 15. One son worked with 8 horses to plough and pull the wagon, and another worked with 6 horses. Peter also describes the delicious watermelons they grow on the farm. He draws a little picture of the melons on their runners on the bottom of a page. Peter sends some seeds to his in-laws in Saxony. The Lutheran congregation was the centre of their social lives. One Sunday Peter and Magdalena had gone to church at Appila (Pine Creek) in their buggy and pair. Their son Charlie and one of the other lads had stayed home and were experimenting with gunpowder. Charlie put a tin over the gunpowder as it exploded and it blew his thumb off. They wrapped his thumb/hand in a sheet, made their way to the church, walked down the aisle in church during the service and showed his parents! They quickly took him to the doctor in Booleroo in the buggy and pair! “I drove Peter to Tanunda once to the hotel and he gave me a florin – freshly minted – a fortune in those days*”. Elisabeth Koch remembered that Peter was visiting them in the Barossa when they had a big flood in 1913. It seems Peter virtually lost contact with his brother Michael who lived at Broadford in Victoria. In 1891 he asked his in-laws in Germany in a letter for any news of Michael as he knew Michael had visited Germany [in 1878 ?]. Peter and Magdalena would speak to each other and the children in Wendish. The children understood it and replied occasionally in Wendish, but usually they replied in German. The grandchildren knew some Wendish phrases, mainly curses or swear words! Only two families in the Appila congregation spoke Wendish. The services were all in the German language. The Pechs were Wendish and were the only family in addition to the Peter Zwar family where the old generation spoke Wendish. In 1904 Peter and Magdalena celebrated their Golden Wedding. Ernst and Andrew travelled all the way over from Western Australia. 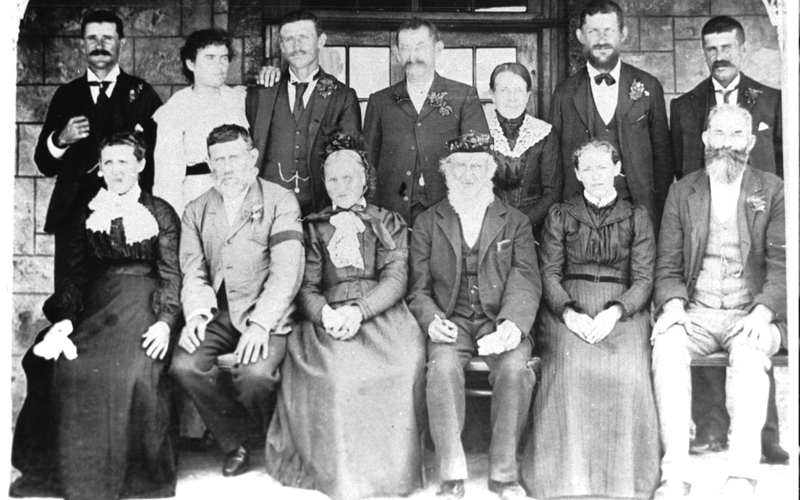 This family photo shows the immediate family seated outside the front door of the house Peter had built on the Appila Yarrowie plains. Standing: L to R: Andrew Zwar, Pauline (1st wife) and Jack Zwar, Ernst Zwar, Minna and Peter Zwar, Carl Zwar. Seated: Anna & Edward Altmann, Magdalena and Peter, Marie and Traugott Joppich. Absent: John Zwar, Elisabeth Koch – she was expecting a child!. On this special occasion Peter and his six sons and a grandson posed for the blacksmith and farm machinery photo that is featured on the Zwar FAMILY TREE Page of this website. When the last son Carl married and left home in 1905 Peter sold the property on the Appila plains to James Daly on 25th September. It was the best land he ever owned. Although he was still a fit man he was 81 years old and Magdalena 74. Then Peter had a small stone house built. [He did not build this one himself.] His grandson Alfred later built a new stone house for himself and wife Jane before their marriage in 1924. This new building incorporated a small room of the old stone home on the eastern side, which was used as the kitchen. A grandson Edgar Zwar could recall the exciting trip to the Laura railway station when he was seven years old to load the bell on the wagon. The large bell still hangs at the Appila Church. Magdalena died on 19th May 1910. She was 78 years old. One of the obituaries mentions that she died at home. It describes her as a very highly regarded and hardworking woman, one of the oldest settlers in the District who had been blessed with good health until shortly before her passing. It also says the couple had lived at ‘Bethel’ for 18 years. This is an obvious mistake. It should read ‘Ebenezer’ and ‘St Kitts’. If there was a connection with Bethel it was because the Moravian Brethren Pastor Schondorf from Bethel had ministered to the Ebenezer congregation from 1854 to 1859. I think he dedicated the first Ebenezer church in 1859. He had a profound influence on the Zwar families in their early years in Australia. Obituaries are often put together in a hurry at a busy time of preparation for a funeral and are not always accurate. [The obituary also mentions they moved from St Kitts to Appila in 1881. I think it was more likely to have been 1880. I once saw a note written by Jacob (West Coast) saying he had moved north in 1878 or 79 – I can’t recall which one. He would only have been six or seven years old at the time. Peter Jnr wrote that he went north 3 days after his confirmation – March 14th 1880. Peter Snr had sold the St Kitts property on Feb 21st 1880. So I think they moved north in 1880. Some of the older boys had probably gone north before this, as land had been bought in the north in1877 and ’79. Maria married Johann Joppich in October 1878 and they settled at Wirrabara, but I don’t know if they went there immediately. KZ]. In his letters Peter referred to his wife as Lena. Maybe everyone called her Lena. After the death of Lena Peter lived alone. There were granddaughters who would come and do the housework and some cooking on each weekend. One recalled having to boil seven eggs and sit them in a row on a rack in the kitchen. Peter would have an egg for breakfast each morning. Because he lived to such a great age many of the grandchildren got to know him and many stories were passed down. Peter could be a moody character! For years there had been times he would go into a melancholy stage and shut himself away in his room and “sulk” for days on end. Food would be passed through the door at mealtimes. It is said that Peter had two doors built into each room of their house on the Appila plains so they could each have their own space and not bump into each other in the house. Their oldest daughter Agnes recalled keeping house for Peter. Ida remembered that he growled a lot. One day she went there to help out and she wore a dress with a collar with white lace and he told her off for coming to work dressed so flash! Sometimes the grandsons would stay with him. Alfred and Edgar would each walk their plough and horses from ‘Kentish’s’ near Caltowie to Wirrabara and stay with Peter for a week or so. Alfred recalled Peter speaking Wendish. “Every night before going to bed he would sing in Wendish, but he would read the devotions at table in German.” Edgar recalled, “I heard my grandfather say his prayers in Wendish when we would work his land in Wirrabara. My father [Peter Jnr] could only speak a little Wendish.” When Alfred came home from working in the paddocks Edgar would go out and open the gate for him and tell him if grandfather Peter was in a good mood to talk to or not. Peter lived to the grand old age of 93. In those days there were no Old Age Homes to retire to and none of the modern medicines and tablets. The flagons of Port and Sherry were about the only medicine to relieve the pains and help the aged to get a good night’s sleep. The grandchildren came and did the housework. A schoolteacher used to call on Peter on his way home. One day Peter had a heart attack. He made his way down to the roadway where the teacher found him and took him to the Altmann’s [ Peter’s daughter’s] place in Wirrabara where he died a few days later. It was 27th June 1917. The funeral left from the Altmann’s house. As was the custom the coffin was open in the house and the mourners would call and view the body. Grandson Edgar aged 14 would recall that “Grandfather looked just normal.” The coffin was closed and the funeral procession made its way through the hills to the Pine Creek (Appila) Lutheran Church. After the service the coffin was carried from the church to the cemetery about 100 metres away. One obituary says that one son and one daughter had predeceased him, and 16 of the grandchildren had also predeceased him. The death occurred on Wednesday of Mr. Peter Zwar, an old resident of the Appila district. He was 93 years of age, having been born, in Saxony on May 15, 1824. He married in 1854, and a fortnight later he and his wife sailed for Australia, arriving at Port Adelaide in November, 1854. He first resided at Ebe- nezer, and then removed to St. Kitts. In 1880 he went to Appila and selected land, and carried on farming, until about ten years ago, when he retired and went to live near Wirrabara. In 1904 he celebrated his golden wedding. His wife died about six years ago. He left six sons, three daughters, 50 grandchildren, and 36 great-grandchadren.